Skala Restaurant has been writing its own history for years. Charismatic because of its position, Skala has the biggest terrace in Ia, from where you can enjoy the breathtaking view to the caldera. 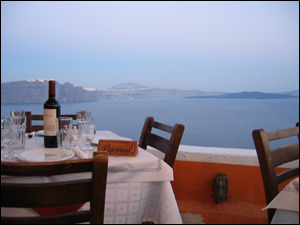 This excellent taverna on a quiet terrace is probably the best-kept culinary secret in Oia. 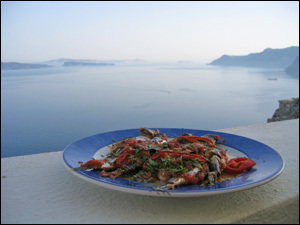 Besides Santorinian specialties like foungato (zucchini frittata) with yogurt sauce, other Mediterranean flavors to savor include shallotand-pine-kernel pastries and seafood pasta. Sophia, the waitress with the sweetest smile, adds a special touch. 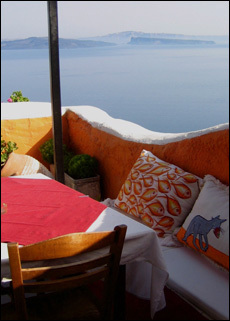 A small gate from Oia's narrow main street leads down to an unprepossessing, crowded terrace under awnings of rush and canvas and centred around an old brick oven. 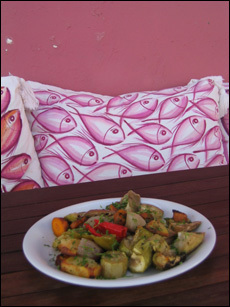 This is Skala, an unpretentious taverna on the site of the village's old bakery. Since its opening in 1984, Skala has been run by the owners Stavros Sigalas and Christos Markozanis, aided by Sophie, their amiable, highly competent and multilingual waitress. The tables and chairs are simple, with red cloths adding a splash of unexpected colour on an island that is almost uniformly blue and white. If you can take the intense heat get a table on the seaward side of the restaurant and watch the cruise liners come and go across Santorini's famous caldera. 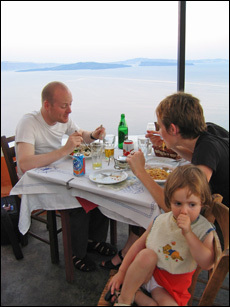 Inevitably there are Greek specialities in amongst the mains – including rabbit stifado and kleftiko lamb – but a great meal can also be made up entirely of mezze – tzatziki, deep-fried chickpea balls, pastries filled with cheese, spring onions and pine kernels, fava beans and stuffed mushrooms. Desserts include baklava, panacotta and Skala's own ice cream. There is probably no better restaurant view in the world than Santorini's vast caldera – a huge hole in the Cycladean seabed that flooded when this volcanic island exploded in 1450BC and appears a deep shade of indigo in the shimmering sea. Skala is perched on the edge of a cliff that drops down 800 sheer feet to the Med. The effect is like being in a restaurant that floats above the clouds. Down below, the island of Nea Kameni is where the new volcano is building up from the seabed. There are also fine views of Oia's white painted churches and houses which cascade down the cliff face like a pile of spilled mah-jong tiles. Meanwhile, Santorini's donkeys put on a very good floor show of their own. These invaluable beasts of burden trek up from the harbour all day long and the narrow steps alongside Skala's low perimeter wall is where they are " recycled" back down to the quayside. Guests who tire of gazing at the dramatic caldera can watch the donkeys, released from their loads, clatter past at speed, pursued by anxious drivers. Skala Restaurant not only respects the history of greek cuisine, but it also enhances its value by suggesting tempting dishes. In order you to come to this conclusion, you only need to taste the crunchy onion pies, which are filled with fresh little onions and pinecone.